Bhí mé ag caint ag IMBOLC i mBaile Bhúirne, Corcaigh sa deireadh seachtain seo caite. Ana bhródúil go raibh mé roghnaithe le caint. Bhí mé ag caint faoi Ficheall cinnte ach níos mó faoi fiúntas fichille sna scoileanna. Fís faoi le teacht. Go raibh míle maith agat Tomás Ó hAodha as IMBOLC don deis. 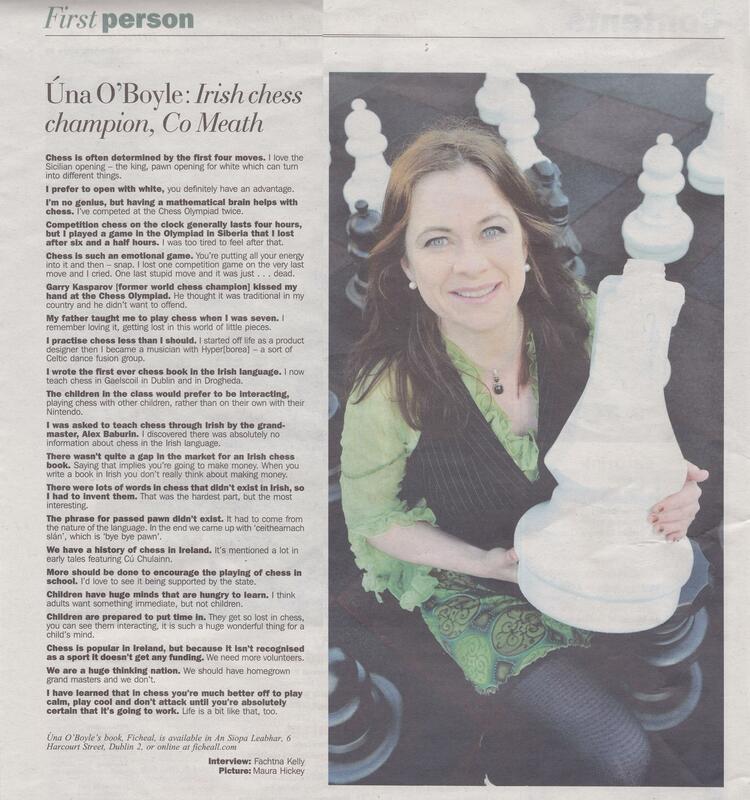 ‘Ficheall’, which means chess in Irish, has already received worldwide acclaim in the chess-world, with one American expert saying ‘ This is super awesome. I’ve looked at all the chess books for children and there is nothing close to this in English. Please, please and please do an English translation’. Una O’ Boyle, the author of the first ever book published in the irish language “Ficheall”, has been nominated in the Irish Language Children’s Book of the Year Awards 2011. It is a unique literary competition, focusing mainly on excellent publishing standards, while also acknowledging the significant role of the authors. Bord na Leabhar Gaeilge and Oireachtas na Gaeilge organise the event on an annual basis and this year’s winners will be announced on Tuesday 15th November. Maith on Cailin Una! To be nominated is such a huge honor, to win it would be incredible! Best of luck Una and we are all behind you.